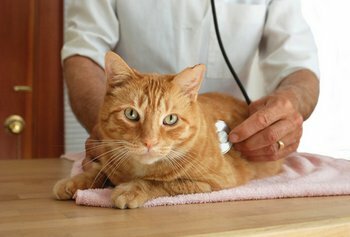 Dr. Jane Matheys, is a veterinarian blogger for cat health insurance provider, Pets Best. Urinary stones (also called uroliths) are rock-like deposits of minerals and organic material. Uroliths can form anywhere in the urinary tract, but they are most commonly found in the bladder. Stones vary in size and quantity ranging from a single, small stone to multiple little pebbles or even a large stone over an inch in diameter. Because these can occur in any cat, whether it lives indoors or out, it’s a good idea to consider cat insurance early on. Pet insurance may help pet owners more easily pay for unexpected pet ailments. Different conditions contribute to the formation of different types of bladder stones. The two most common types in cats are struvite (magnesium ammonium phosphate) and calcium oxalate. Struvite stones are becoming less common as most commercial diets are now formulated to reduce the likelihood of struvite formation by limiting the amount of dietary magnesium and promoting production of more acidic urine. 1. Check for Symptoms First, and most importantly, if your cat is displaying symptoms you will want to take her to the veterinarian as soon as possible. Cats with bladder stones usually show symptoms typical of other lower urinary tract diseases: bloody urine (hematuria), painful urination, straining to urinate, frequent urination, urination outside the litterbox in unusual places, urine spraying and licking the genital area more frequently. Some cats with bladder stones may show no signs at all. 2. Act Fast Occasionally, a small bladder stone will get stuck in the urethra as it tries to pass out of the bladder causing a total blockage with little to no urine production at all. Urinary obstruction is a true medical emergency, and any cat suspected of suffering from this condition must receive immediate vet attention. If the obstruction is not relieved, the cat will eventually lose consciousness and die. A cat experiencing urethral obstruction shows the same symptoms listed above, but as time passes, an obstructed cat typically becomes much more distressed-often crying out in pain. If bladder stones are big enough, the veterinarian may be able to feel them through the cat’s abdominal wall. However, they are most commonly diagnosed with x-rays, ultrasound, urinalysis and urine culture. The treatment of a cat with urinary stones depends on the mineral composition of the stones. For cats with struvite stones, a special stone-dissolving diet may be prescribed to eliminate the stones. If the diet fails to dissolve the stone, then surgical removal may be necessary. Calcium oxalate stones cannot be dissolved with special diets, and most often surgery is required. 3. Consider your Options Treatment of urethral obstruction usually involves catheterization under anesthesia to try to flush the stone out of the urethra. Surgery is sometimes necessary in addition to hospitalization and supportive care. This can be an expensive proposition, so it is wise to purchase pet health insurance to help cover the costs of unexpected medical emergencies. Cats that have had a bladder stone are at risk for recurrences of this pet health issue. However, dietary management can help a great deal to prevent future formation of both struvite and oxalate stones. In addition, canned diets do a better job of preventing recurrences because they encourage more water consumption than dry diets. 4. Provide After Care After your cat has been diagnosed with bladder stones, you will want to keep a close eye on her, since they can reoccur. More frequent vet check ups may be necessary. Speak with your veterinarian to determine what the best after care will be for your pet.